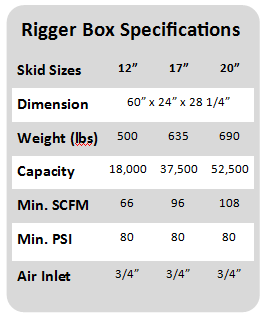 Align Production Systems' brand Airfloat Is Proud To Introduce Our Newest Product Line, The Air Skid Rigger Box. 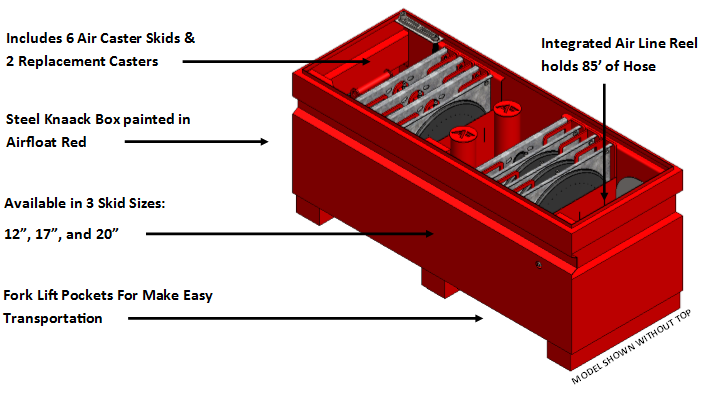 Align Production Systems’ brand Airfloat Is Proud To Introduce Our Newest Product Line, The Air Skid Rigger Box. The ideal product for those in need of an easily transportable Air Skid solution, the Rigger Box is comes in a 5’x2′ Knaack Box with fork pockets, and will conveniently fit in most truck beds. Available in 3 different sizes, the Rigger Box can be used for moving heavy objects weighing up to 52,500 lbs. To see which Rigger Box would be ideal for your needs, please see the table to the right. The Rigger Box is the perfect solution for moving from job to job, and comes with everything needed for operation, including spare parts. Click the button bellow to learn more.